Don't get ahead of the process. The end of November is usually a good time to winterize, after there have been several hard frosts, and the roses are dormant. To begin, water thoroughly so your plants go into winter fully hydrated. Over the winter months, if you don't get an inch of rain or a foot of snow during the month, get the hose out on a day above freezing and water your roses to keep them hydrated. Then, if you performed routine fungicide spray treatments on your roses during the growing season, spray the canes and the soil/mulch around the base of the plant. Some rose growers remove all the leaves from the bottom 12-15 inches of the plant to reduce fungal infection. If you don't spray during the growing season, you can skip this step. Roses that are grafted, or not reliably winter hardy in USDA Zone 5, should be protected over the winter. Clean up fallen leaves and debris from around the plant. ​causing fungal disease or death. 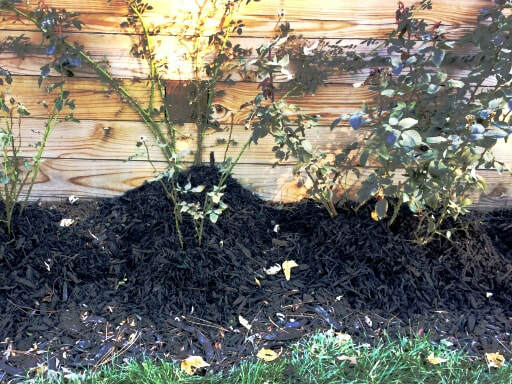 Note, that Easy Care Roses, and roses growing on their own root system, don't need this extra mulch around the canes, but would benefit from a 2-3 inch layer of mulch around the base to conserve moisture and moderate temperature. The photo at right demonstrates hardwood mulching without a cage. Long canes that might whip around in winter storms and damage themselves or their neighbors, can be pruned back to about waist high. ​Canes of climbing roses can be securely attached to their trellis or another support. Don't do any other pruning until spring.